Flat surface pH and ORP electrodes. AMALGAMATED Instrument Co (AIC) offers a range of flat surface pH and ORP electrodes that resist fouling in pH and ORP applications. Material from the stream being measured can build up on a conventional bulb electrode and cause errors. 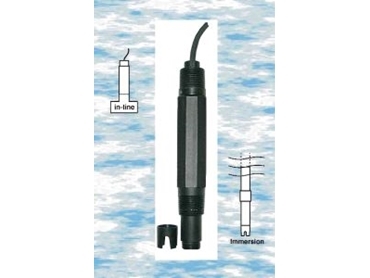 A pH or ORP electrode with a flat sensing surface gives a degree of self cleaning when exposed to turbulent flow. This minimises maintenance, suiting the electrodes to industrial applications requiring long periods between maintenance. The non-protruding surface minimises electrode breakage and provides abrasion resistant operation. The electrodes have a double reference junction and a supersaturated KCl reference called DURAGEL that provide a long, stable life. The combination of double reference junction and DURAGEL also enhances the electrodes' contamination resistance. A Pt1000 or Pt100 temperature compensation sensor is installed at the sensing tip of the pH model to ensure accuracy of measurement with changing solution temperature. The electrode has 3/4" NPT threads at each end of the body to maximise installation flexibility. The pH electrode has a pH range of 0 to 14pH, a temperature range of 0°C to 60°C and can be installed in pressures up to 7 bar (100psi). The ORP electrode has similar specifications to the pH electrode with a measurement range to 1000mV. The wetted materials are glass, polypropylene and platinum (ORP electrode). The polypropylene body gives the electrodes resistance to chemical corrosion and heat stress breakdown that further ensures usability in a wide range of applications. The electrodes are compatible with AIC's range of pH instrumentation such as the PM4-PH or PM4-OR panel mount monitors, the RM4-PH DIN rail mount monitor and the dual input TP4-PH wall-mount monitor.